When Foundry first started their Darkest Africa range, I was quite excited. The possibilities for adventure in the great untamed continent seemed endless. And so it has proven. So of course I needed to make some scenery for my games. Where better to start than huts? A quick internet search showed a wide variety of native buildings: I chose these because they are so generic. They sort of scream ‘African Hut’, but with wicker or stone walls, they would serve equally well as Celtic round houses. They MAY be a little small (or not) but it’s always better to have buildings as small as possible (without looking stupid) so they don’t take over the table. When this was dry, I cut doors into the ‘front’. I left mine open, but you could close them with a screen, curtain, or even a wooden door. The roof is a cone made of poster board. It’s three layers thick, bound with white glue and is now a strong cardboard cone. To attach the roofs, I made a ring from layers of poster board sized to fit the top. Using tabs, I glued it to the cone. The thatching is made from teased out 1″ lengths of cotton string, teased out and glued down in layers, a tiny bit at a time. (To avoid warping) The bottom row takes forever, but each one above it takes far less: The last takes no time at all, and extends past the top, where it is tied off in a tuft. The whole roof is painted with diluted white glue, and painted once dry. They are a bit time-consuming, but I think they are worth the effort. The grain jars (Yes, they really are that big in real life!) are turned wooden candle-holder cups from a craft store. On the other hand…. In another craft store, I found papier-mache birdhouses, the same size as my huts, and the same shape (albeit with a shallower roof). All they needed was a door cut in (or painted on) and thatching, to make huts every bit as good-looking as mine. The pot by the door is a wooden bead with a rim made from soft wire. Simpler huts, seen in the Soudan and other places are made by making a circle of upright sticks, and tying them together at the top. Sticks are woven through these, making a loose basket, and thatching is attached over these. Apache Wikiups are made in a similar fashion. 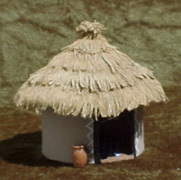 Zulu storage huts are similar, but set up on platforms. Zulu huts have walls , but rounded rather than pointed tops, and all tend to have a distinctive pattern of weaving: I’ll make some Zulu huts later. . I formed the shells of these over 1/2 Xmas decoration balls from a craft store, using layers of paper & white glue. I formed them inside the ball sections, and removed them while they were still wet. When they hardened, I attached them to cardboard bases (for strength) and thatched the exterior with glue & string. When all was hardened again, I cut the doors and painted the thatching. You could just cover Styrofoam ball halves with paper & thatching, It would be easier, faster, and probably just as effective. wow cool! exactly what i needed for school project!!!!!!!!!!!!!!!! !